After a solid week of the daily grind of sight-seeing, visiting the palace of his Royal Highness the Mikado, the ruler of the island Empire of the Rising Sun, the great lord of the land of the chrysanthe­mum; curious old temples, tea-gardens, the great theater at Tokio; taking a trip to the giant statue of Diuputsu, the bronze god of wisdom, and doing the curio shops, until satiated with far Eastern lore, I con­ceived the idea of visiting the Oriental prima donna at home, and communicated it to the obliging little Japanese guide, who had been our constant companion and adviser since our arrival at Yokohama. I was informed that there was no Japanese prima donna, and could hardly bring myself to believe it. Think of a land of painting, poetry and song, without a prima donna! But such is really the case. Japan has no music of her own, so why have any great singers? 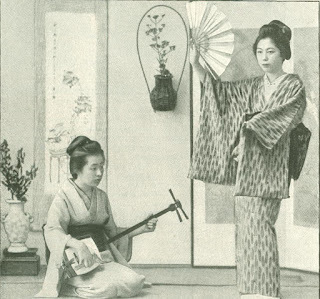 There is no denying the fact that, with a decided love for music, the Japanese are sadly unsuccessful in their efforts to make it. They easily learn the airs of other lands and become proficient in the use of foreign musical instruments, and enjoy them, but their national music is intolerable. The Japanese opera is a reality, however. 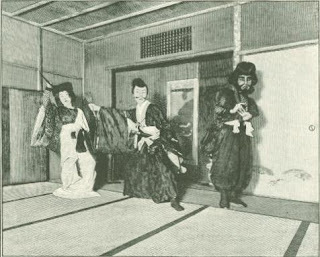 Bands of professional singers and musicians travel about, with only a stand to hold the libretto, from which they give declamatory readings, accompanied by the music of the samisen and other instruments; and those who understand them insist that these operatic productions are artistic and really worth hearing. To me, however, in the only tea-garden performance of opera I ever had an opportunity of hearing, the sole charm lay in the surroundings, the gayly dressed audience, the paper lanterns shed ding a soft, mellow light among the trees, the gentle sighing of a slimmer wind and the low, moaning swish and swirl of the tide on the Leach. The tea-garden is the favorite Japanese pleasure resort about which many volumes have been written but there are gardens and gardens, ranging from those frequented by the aristocratic families to the real "dive" variety and one must be sure of the guide to avoid being found where the performance would shock even the most broad minded traveler. Fully determined to visit a native operatic artist, either in her home or in her dress­ing-room at the tea-garden, I bribed our guide to arrange for the interview without informing any of the other members of our party and awaited results. My patience was rewarded by being informed that Ito (not the Marquis) had arranged for me to go the following evening to the quarters of a troupe of geisha girls, who were living in a large house across the river from our hotel, just at the foot of the bluffs or range of hills back of the city of Yokohama. When the time arrived I managed to get away from the hotel on the plea of a slight headache, and after my friends had started for the theater to hear an English company, I slipped out of the house, entered a jinrikisha, and away we went through the streets to the river over a long narrow bridge and through crooked lanes, to an old house, where I found at least a dozen pretty Japanese girls huddled into a small outer hall or room, evidently awaiting my arrival. They crowded around me all talking at once, and were quieted only when a middle-aged woman entered and spoke to them: then turning to me she said in excellent English: "We are pleased to see you, miss. Your servant has explained that you are a public performer in your own land, and we were as anxious to meet you as you can possibly be to see us, for although we see many foreign women in this country, we seldom meet with one who takes part in public entertainments." I was conducted to an inner room and re­quested to lay aside my wrap and hat and join the party at dinner, and although I had struggled through the table d’hote at the “Grand" hardly an hour before, I was delighted to accept, and we were soon seated on a large mat of rice straw, and served with boiled rice, dried fish, poultry, and several kinds of vegetables, nearly everything being eaten with a delicious, highly spiced sauce called soy. A spoon and fork were furnished for my use: the others used their cups and small bits of white wood to help themselves from the dish or kiwi in which the food was served. 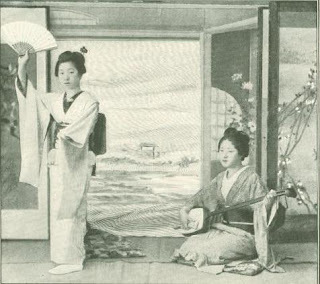 Cakes, confectionery, preserved fruits, and finally tea, and rice brandy called sake were served: and then a stand with a box con­taining the requisites for smoking was brought in, and we were all supplied with dainty little silver-tipped pipes. One of the girls, who had made a pro­fessional trip to Hong Kong, and who had learned English, chatted with me, while the hostess directed the repast and conversed with me in English and the girls in Japanese, explaining things generally. Occasionally some speech would cause a great deal of laughter, in which I would join without understanding the cause. The general mirth was contagious. I was shown the rooms of the girls, who sleep on soft mattresses spread on the mat-cov­ered floor. Their clothing is hung on a sort of curtain pole. Each girl has a lackered box with many drawers or compartments for holding toilet articles, and each is provided with a highly polished metal mirror. A paper screen is found in each apartment, but not a chair or table did I see in the house. The rooms are formed by thin movable partitions, which can be taken down at any time to make one large room. I was instructed in the art of make-up, and at the suggestion of the English-speaking girl disrobed and changed costumes with her, while the other girls assisted us, laughing and chattering all the time like caged magpies. Laughter is the natural stimulant of the Japanese girl; she thrives on it, and indulges in it on the slightest provocation. The girls closely examined each article of my clothing as it was explained by Mina, and put on by Komura, whose identity rapidly began to vanish under the quantity of clothing she was assuming. She was about my height, and the garments fitted her tolerably well. Her small, prettily shaped head crowned a slight but ele­gant figure, which might have been grace­ful if left to itself. Her pouting lips were radiant with agreeable smiles, and her white neck lost itself in a young, shapely bust; in repose she was a dream, but once in motion the charm of the picture was lost, as she had the awkward waddle caused by the absurd national costume, which is the most artistic and picturesque dress in the world for a woman in repose, but in which graceful action is an impossibility. I was soon incased in a dainty jacket, linen stockings and sandals, with an elaborately embroidered overdress (or kimona), with huge flowing sleeves, and a beautifully wrought obi or scarf tied around the waist, with a great bow at the back held in place by a strong cord of red silk. My hair was then done in Japanese fashion, and with a liberal use of the make-up box I was transformed into a fair imitation of a geisha, while Komura wore my cloth­ing with more grace than I expected. My entertainers danced and sang songs, and did everything to make my visit both pleasant and instructive; in return I sang for them. The hour for my departure arrived all too soon. My friends entirely failed to recognize me in the Japanese costume, which I wore back to the hotel through the consent of the owner, and which she called for the following day. The geisha, like the prima donna, has her troubles, being under contract for a number of years with a manager. Oh, that man­ager! He is in Japan, as in America, a necessary evil. 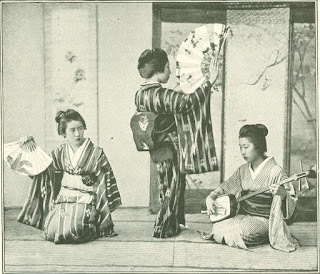 The geishas appear wherever there is an occasion for merry-making, and are very agreeable persons in their own land, but as unlike the geishas of the stage as can possibly be imagined. They have at­tracted much more attention, in Europe and America, since Sir Edwin Arnold's se­lection of one of these daughters of the stage for a wife. A great proportion of these girls are the daughters of the samri, the soldiers or knights who were attached to the households of the great lords under the feudal system, until the present gov­ernment left them nothing but a knowledge of fighting and a disposition to do it, without either fortune or occupation. These soldiers' daughters are proud of their ancestry, and a number of them wear on their costumes the coats-of-arms of their houses. The majority of them marry well, many with the wealthiest of merchants or most prominent officials in Japan. Their movements are given as much promi­nence in Japanese periodicals as are the doings of the brightest operatic and dramatic stars in this country, and the en­gagement of a geisha to a prominent individual is made as much of there as is the wedding of an actress to a European nobleman or an American millionaire. There is another order of geisha, called the hatta or etta girl, who is of a lower caste. 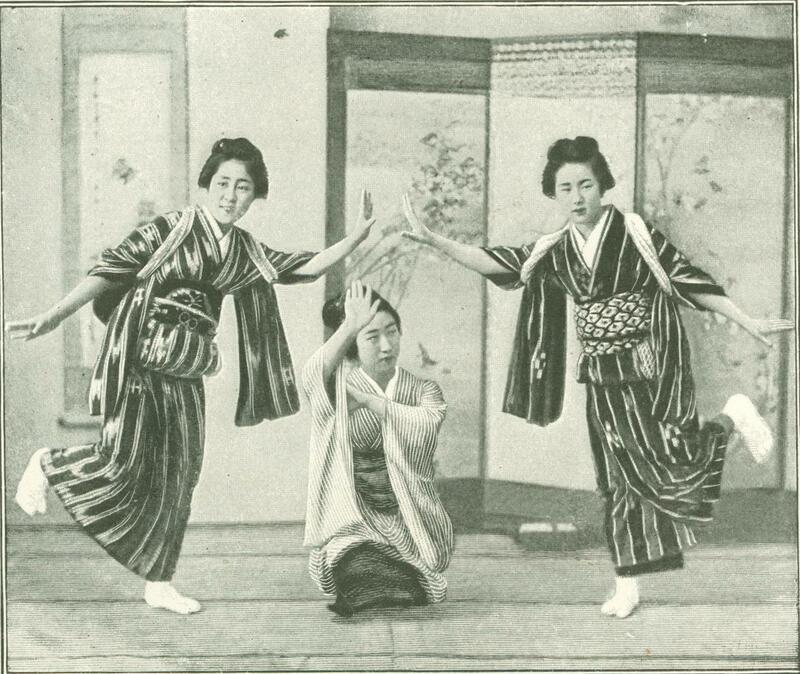 The recitations of the geishas are usually native poems, love stories and romances; while their dances represent the four sea­sons. One very popular figure is called "The Dance of the Moon." Originally published in the Cosmopolitan Magazine. December 1898.